Since the tragic earthquake of 2010, Haiti has been the subject of worldwide attention. All would agree, the devastation seems particularly cruel to this struggling country. Massive relief efforts have been forthcoming and have demonstrated considerable generosity and determination from individuals, organizations and countries. For Haiti to stabilize, this effort will require a consistent long term commitment. There is no one solution to solve all of Haiti’s problems. Rather it will take a thoughtful program of balance and renewal. In the most simplistic terms, much attention has been focused of establishing basic ingredient for recovery. 4. Generate new economic growth generators. We would add a fifth ingredient: Innovation. In the midst of the turmoil, Haiti has a unique opportunity to explore not only conventional (and necessary) rebuilding models, but also to embrace innovation. 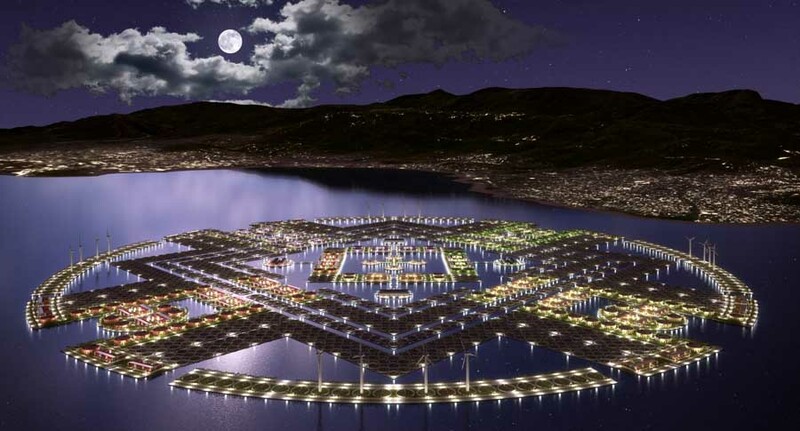 This presentation proposes to build a floating agricultural / light industrial city off the shores of Haiti. For purposes of defining we have named the community, Harvest City. Harvest City is envisioned as a vibrant fully functioning city of 30,000 residents which embraces three major concepts. 3. That harvest City should be established as a “Charter City”. Charter City is a relatively new and advanced economic model specifically developed for struggling nations. In addition to accommodating city services, Harvest City has been designed with an integral program of economic capabilities. This mixture is two thirds agriculture and one third light industrial. Harvest City is envisioned as a 2 mile diameter complex of tethered floating modules. The overall design is divided into four zones or communities interconnected by a linear canal system. The four major canals will focus built neighborhoods consisting of four story housing complexes. The outer perimeter of the design is predominately “one acre” crop circles with secondary feeder canals. The inner “harbor” will house the city center with schools, administrative, community activities and general marketplace. The entire complex will float and be cable secured to the sea bed. Because of its low profile, low draft dead weight capacity and perimeter wave attenuators, hurricanes and typhoon will have little effect other than collection of much needed water harvesting. A breakwater will be constructed to add to the city’s stability. (It should be noted, this proposal suggests using all the concrete rubble debris from the earthquake as the breakwater filler.) Harvest City is seen as the first floating city for Haiti. The system of floating platforms allows for a master plan to grow and link to other future cities within the harbor. It is the intent of this proposal that the design of Harvest City components be easily constructed, practical, and a simple, refined design execution. 1. Concrete Hulls: Concrete is the ideal material and method of construction for this project. Concrete hulls have a long successful history of use, particularly in salt water. Life cycles range from 60 to 100 years. These hulls are easily manufactured in a staging area on land and then towed into place. The process and materials is very low tech, economical, and can assume many shapes. The manufacturing of concrete hulls is in itself a new industry for Haiti. 2. Crop Circles: The basic crop circle is one acre in size, (US). The “crop circles” can be imagined as floating “pie pans” filled with top soil (any shape is possible). The circle was chosen to deflect waves and for its use of rotation irrigation systems. Circle walls remain high to stop wave penetration. A series of wide floating walkways interconnect zones of crop circles allowing movement of crops. Crop circles are a generic term focused on cash crop production. However it should not rule out other uses including livestock etc. 3. Residential Neighborhoods: Basic construction is simple”tilt wall”, 4 stories, concrete wall and floor systems. These hurricane resistant materials also provide insulation. For estimating purposes we are assuming an average of 3 persons per unit. The typical unit size is 490 square feet and is an enlarged studio apartment. Though 90% of all units are studios, design provisions have been made for one or two bedroom types with light and air shafts. There are 560 units per neighborhood averaging 1,500 residents per neighborhood. These are minimal units, providing a pre-fabricated kitchenette and two dividing walls. Roofs slope to water fill tanks and are supplemented by limited single unit portable desalination units. Window placement allows cross ventilation and air is further cooled by large passive bamboo shades. Initially, all bathrooms / showers will be dormitory style. Four such areas (men and women) will be located on each floor. These locations will centralize sewage and waste water / gray water collection. 4. Color and color design pallets are initially proposed to suggest individuality and a vibrant vitality. 5. Processing Warehouses Warehouses are simple Quonset hut structures, secured to concrete hulls. Long airport hanger doors allow air flow for use and protection from heavy winds. These Quonset structures are also ideal for light industrial and assembly types of usage. 6. Crops: In addition to the crop circle agriculture, all plantings are cash crops. This includes neighborhood plantings and all other designated vegetative areas. 7. Power Current electrical power for Haiti is sporadic and not totally dependable. Their best solution is to refurbish its existing land based hydro electric dam. Harvest City must look to a more sustainable energy source, in this case, a combination of solar collection roof panels, and proportioned perimeter wind turbine arrangement. 8. Water Floating aquifers have been proposed as water tanks, secured to concrete hulls with gravity fed piping to specific neighborhoods. These facilities will use covered tops to collect water and protect it. This proposal recommends that some water be piped from land to these aquifers to protect the land based aquifer supply. (Another earthquake could rupture the land aquifers and allow saltwater to contaminate them) As a supplement, compact desalination units could add additional water sources. These units would be solar panel electric sources. 9. Waste: There is no central sewerage treatment plant. In its place are a series of compact treatment plants requiring little energy consumption. In addition, central bathroom facilities would recycle all gray water and use newly developed compost toilets. The concept of Charter City is a relatively recent theory which promotes the establishment of foreign assisted specialty economic zones within the borders of existing countries. Economist Paul Romer has introduced the Charter city concept as a viable catalyst to assist struggling countries in the creation of energetic economic expansion which in turn creates regional opportunities. The theory has distinct advantages of receiving foreign financing, security, and self rule. The plausibility of the city concept establishes an entity removed from existing conditions normally associated with precarious and harmful living conditions which often plague developing countries. In most cases, available land is convenient and ample for such separation. However, Haiti is definitely land locked and extremely mountainous, thus the proposal to build a floating landmass. Though the theory of Charter City is still in its infancy, it’s being carefully reviewed by several countries. The proposal of harvest City is both a bold and simple idea. It attempts to bridge both short and long term objectives for Haiti’s ongoing recovery. As stated before, Harvest City is seen as a complimentary element of that recovery. This initial program should be viewed as conceptual only and can easily accommodate whatever program is determined. Innovation, when appropriately applied, is a tool which can solve problems and provide refocused hope on seemingly unsolvable situations.